There is no doubt that pistols equipped with red dot sights are here to stay. That’s the future of handgun shooting, and while the technology isn’t quite 100% yet, for many shooters it’s an excellent solution. I’ve done a bit of work with dot equipped pistols in the past, but thought it was high time to commit some of that work to paper. Our initial test platform is a Smith & Wesson M&P9 with thumb safety that has had the slide milled to accept a Trijicon RMR and equipped with a Crimson Trace Railmaster Pro green laser/light. Other than the RMR modification, the gun has had zero modifications performed to it. Everything on this gun is stock, which means it has a 5+ pound trigger, normal recoil system, stock barrel. Which means we can answer the first question of “is it accurate?” Yes, it’s just fine. Here is a 2.1 inch group fired at 50 feet, standing unsupported with Federal 124 grain FMJ ammo. I did shoot it for groups at 25 yards as well, the best I was able to pull from the standing, unsupported position was around 4-5 inches. This is in part because the trigger is actually pretty heavy, and the 6.5 MOA dot that’s riding on the gun. So let’s talk about that dot, because you’re probably more interested in that than anything else. It is a Trijicon RMR01, which runs on a single CR2032 battery, and features a 6.5 MOA dot. There are advantages and disadvantages to running a dot on your pistol. The obvious advantages are that you can keep both eyes open and look at the target, and it is easier to make accurate shots at long range on demand, because you don’t have to line up the sights. 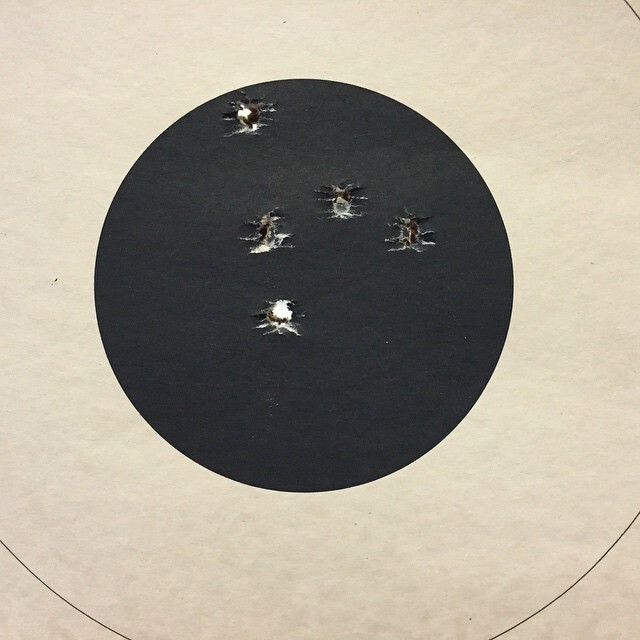 I find the dot to be a little bit faster for the first shot on targets past 15ish yards as well. The disadvantages to the dot are that it’s slower than iron sights when you’re in close, and it’s slower in transition and follow up shots as well. You lose the dot every time you press the trigger, so getting back on target and not fishing for the dot requires good recoil control and a good index. Some people say you should try to track the front sight of your backup irons, which sounds dumb to me. The entire point of the dot is to free you from the tyranny of a hard front sight focus and let your eyes do what they’re best: look straight ahead at stuff far away. The light/laser combo from Crimson Trace is one of my favorites. 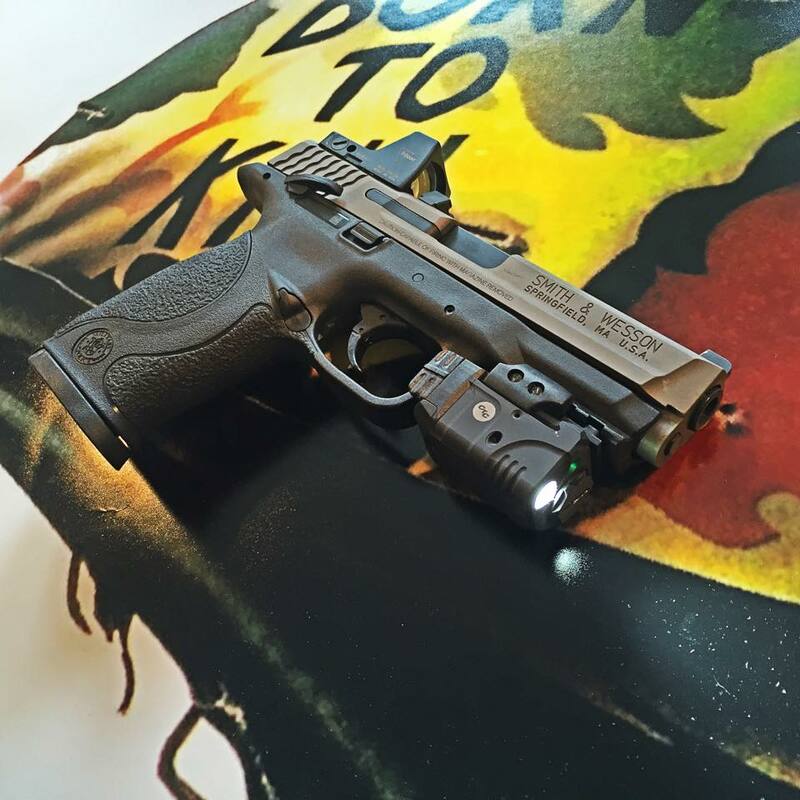 I like the green laser, because you can see it during the day, and I like the white light because defensive handguns should have lights on them. I’m not a light snob, I don’t eleventy billion lumens to melt someone’s face off in the night. The Crimson Trace has worked well for me at multiple night shoot events and even a low-light shindig at Gunsite, so I try to not mess with stuff that works. The reason I like having the laser on there is because I accept that shooting stuff in the real world may not be as cut and dry as square range work, and there may be an instance where I want to get aimed fire on a thing, but can’t bring the sight window up to look at it. By far, this is the most “tactical” gun I own. I’m not really tied into that side of the shooting community, even though I’ve taken classes from “name” trainers and organizations. But I’d be dumb to ignore how much the tactical shooting community is driving the industry, moreso than competition shooting right now. I can also see the appeal. While shooting with a red dot has some complications I’m not used to thinking about with pistols (height over bore, seriously?) it’s also generally easier. I don’t have to focus on sight alignment, my eyes don’t get tired as quick because I’m not doing some kind of focal wizardry, and I tend to think that if you’re a novice shooter or someone who’s not going to train obsessively, it’s a good choice, because it makes getting hits easier. I am no expert, but it would seem that if the Red Dot was co-witnssed with the front sight, it would make keeping the Red Dot easier. At least that is the way it seems to work for me with the AR15. The red dot on this gun is co-witnessed with the front sight, the problem with that is that I’m not looking at the front sight at all when using the dot, I’m focused hard on the target and I only “see” the dot as it’s super-imposed over the target in front of my dominant eye. Really? Some of us like M&P’s! M&Ps are probably the worst of the popular Production/SSP polymer guns in the accuracy department, ranging from average to shameful. KKM barrel improves things somewhat. Apex trigger kit helps also. And this is coming from an M&P guy. I have two M&P Pro, 5″ pistols. They are as, or more, accurate as any Glock, XD or Beretta that I have shot. Trigger was rough out of the box on one, but nice on the other. The triggers keep getting better. I also shoot a FS M&P .45, that has an APEX trigger upgrade, and I will put it against any plastic out there.